Photos by Mike Munroe (top left), Jenn Burt (bottom left), and Wiebe Nijland. 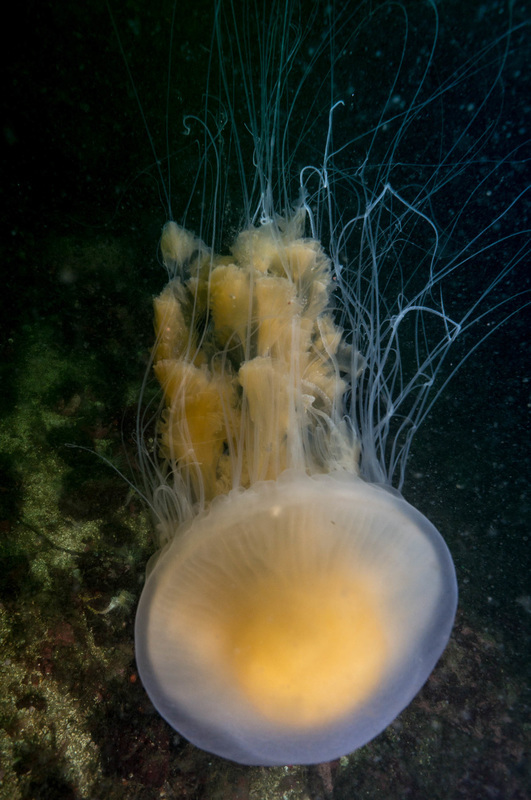 The fried egg jellyfish is translucent, white, or pale yellow with a yellow internal mass (gonads) which gives the bell the appearance of an egg freshly cracked into a pan. The bell has a scalloped margin consisting of 16 large lobes interspersed by smaller lobes, with up to 25 tentacles hanging from each lobe. 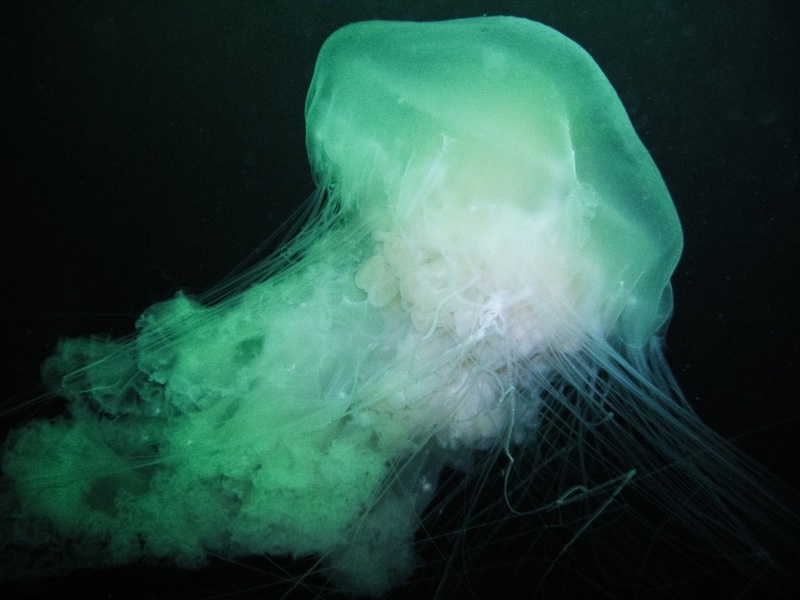 This species gets up to 60 cm in diameter, with tentacles trailing below for up to 6 m.
The fried egg jellyfish inhabits coastal temperate waters around the world. 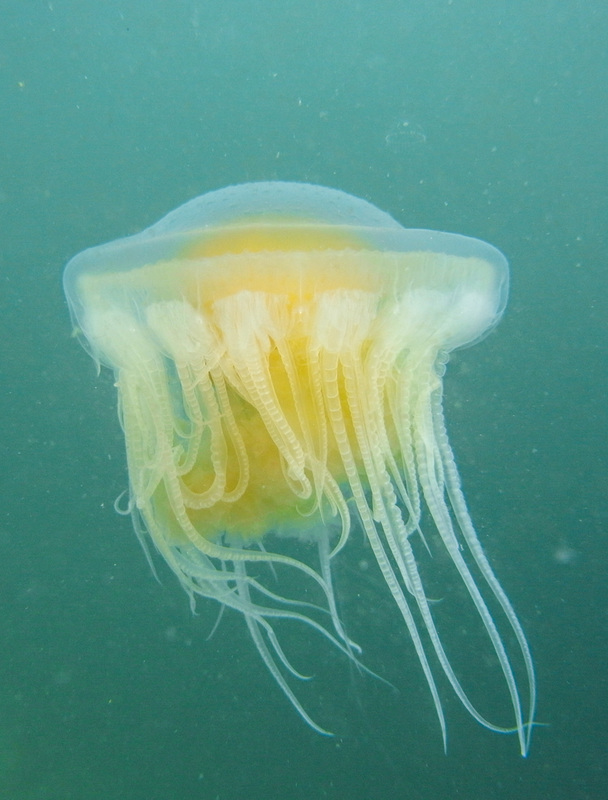 The lion's mane jellyfish (Cyanea capillata), which can occasionally be white, is distinguished from the fried egg jelly by the eight large pairs of lobes that edge its bell margin. Unlike the lion's man jellyfish, the fried egg jellyfish has a mild sting. It often hosts small crustaceans and small fish on the subumbrella and exumbrella. Harbo, R. M. (1999). Whelks to whales: Coastal marine life of the Pacific Northwest. Madeira Park, BC: Harbour Publishing. P. 68. Smith, C.R. (2002). Phacellophora camtschatica (Brant, 1835). Invertebrates of the Salish Sea. Rosario Beach Marine Laboratory. Accessed 10/12/2014.